This innovative and pioneering producer is located in the Green Valley sub-appellation of the Russian River Valley. 160 acres are planted to Pinot Noir and Chardonnay. The founding partners, Audrey and Barry Sterling, chose this very cool and foggy site in 1976. The original 110 acres were planted by Forrest Tancer who was working for Rodney Strong. 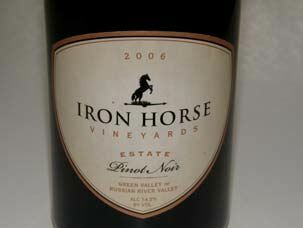 Iron Horse was the most westernmost vineyard in Sonoma County at the time. Forrest and the Sterlings subsequently became partners and built a winery. A Chardonnay was bottled for their first vinttage in 1978, and the winery officially opened in 1979 with the release of an Estate Pinot Noir and sparkling wines followed the next year. Sparkling wine production was initially a solution for what to do with 55 acres of Pinot Noir in Sonoma in the late 1970s. A replanting project began in 2005 with 50 acres undergoing re-planting based on current viticultural advances under the direction of Daniel Roberts, aka Dr. Dirt. Precision farming of the estate's 160 acres is practiced based on GIS/GPS mapping. The name Iron Horse came from a locomotive that stopped at nearby Ross Station at the turn of the 20th Century. Iron Horse along with Schramsberg have been California icons of sparkling wine production. The Thomas Road Pinot Noir has been the flagship Pinot Noir, recently joined by Q Pinot Noir from special blocks in the estate vineyard. Joy Sterling is the current CEO of the winery and represents the second generation at Iron Horse. Other members of the Sterling family are involved in the management of the winery including Joy's son, Laurence, who manages the Green Valley vineyards. Forrest Tancer retired in 2005. David Munksgard, who joined Iron Horse in 1996, is now in charge of winemaking. Production is 30,000 cases annually. The lineup of still and sparkling wines (100% estate grown) are available on the website and there is good retail distribution as well. Tours are by appointment Monday through Friday. The tasting room is open daily from 10:00 AM to 3:30 PM at 9786 Ross Station Road in Sebastopol. 707-887-1507.